Cool Things We Have Because of the Soviet Union (That America Took Credit For)! I grew up in Germany right after the end of the Cold War. One of the last places we visited before moving back to America was Checkpoint Charlie, and my parents have proudly displayed a piece of the Berlin Wall in their china hutch for years. Understandably, I’ve always had a certain fascination with the Soviet Union. And like any facet of recent world history, you occasionally learn something really neat. Anyone who’s been on the internet for more than five minutes already knows that Tetris inventor Alexey Pajitnov was royally screwed out of ownership of the game by the Soviet government, but they weren’t the only ones. Once Tetris was ported to IBM computers, the Soviet video game division, Elorg…wait, there was an actual “Soviet video game division”? Speaking of things you’ll find on your TV screen, how about home video? The Video Tape Recorder (VTR) was the first device that allowed TV shows to captured on film. It was created by Alexander Poniatoff, whose work led to the first home VTR in the 1970’s, setting the stage for Betamax and VHS. However, in spite of all this, the credit for inventing the VTR tends to go to an employee of his, Charles Ginsberg. There doesn’t even seem to be a real reason for this; they both worked to invent the machine and Poniatoff was the head of the company that built it, but Ginsberg tends to get sole credit for it. OK, that one was still technically made in the USA, so how about home computers? For all that he gets overlooked now, nobody denies the impact Steve Wozniak had on the computer industry. Hell, the subtitle of his autobiography is, “How I Invented The Home Computer…” But even that might be giving the Woz too much credit. You see, Apple released their first home computers in 1975, but in 1968 Arseny A. Gorokhov came out with a device called an “intellektor,” which was, you guessed it, a home computer. You know who else tends to get left out of history? The person who invented the cell phone. Mostly because no one can agree on who that is. It’s probably been brought to your attention at least once that one of the inventors of what would eventually become the modern cell phone was none other than glamorous movie actress Hedy Lamarr. Actually, being that this isn’t WW2, this fact is probably the ONLY reason you’ve heard of Hedy Lamarr. Which is a shame, because she was REALLY hot! You can probably tell from the rest of the article where this is going, but it’s not just Lamarr who gets more credit than she deserves. If you go on to any website where they debate the inventor of the cell phone (because of course they exist) it’s pretty evenly divided between historical revisionists who want to see Henry Sampson get the credit he deserves, and people who may-or-may-not-be-but-most-likely-are racists contending that Martin Cooper is the only man who could possibly have invented the glory that is…we’re arguing about cell phones, people! Either way, both sides are wrong. 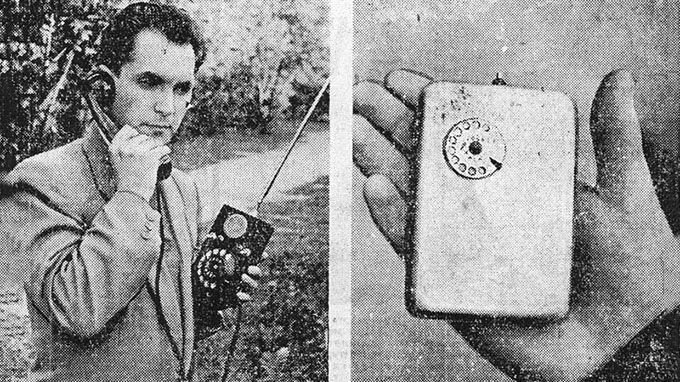 Starting in 1955, Leonid Kupriyanovich, a man with possibly the most Russian name ever, developed a series of increasingly smaller walkie talkies, which culminated in a “pocket automatic radio phone,” the most direct antecedent of the modern cell phone. Kupriyanovich was actually a pretty big wheel in Russia, back in those days. His invention was in common usage, and he actually got his own car out of the deal. He was the Soviet equivalent of big pimpin’! So…big czarin’? Still, if you try to look up who invented cell phones, odds are you’ll see it credited to Martin Cooper. Now, that’s the everyday stuff, but you wanna hear about the superhero stuff, right? That the laser was invented by multiple people is not in question. The men who get the most credit are Nobel Prize winner Charles H. Townes, Gordon Gould, and Arthur Schawlow. They get the majority of the attention because of a long-standing legal battle between Gould and Townes over who owns the patent on the final design. Blood transfusions have existed, in one form or another, for hundreds of years. These days, most of the blood you get comes from blood banks, unless you’re trying to gain super-powers by getting plasma from your cousin, The Incredible Hulk. This may only work for females, though. So, who gets credit for inventing the blood bank? Was it Dr. Charles Drew, whose pioneering research helped make storing blood possible? Bernard Fantus, who started the first blood bank in America? How about Sergei Yudin? You see, the idea for blood bank grew out of a much cooler idea of taking new blood out of fresh corpses, using a process called “cadaveric blood transfusion.” Records from back then are a little murky, but the process is pretty decisively agreed upon to have been invented by either Yudin or fellow Soviet Vladimir Shamov, though Yudin has a much stronger claim. This all ignores the most important question, though: why would anyone want to replace such an awesome idea with boring old blood banks? This, however, is just a small sampling of things you might take for granted that actually have pretty interesting back-stories. You should look into them, sometime! Did 1961’s The Avengers Influence Real Life? Enjoy This 1958 British Pathe Newsreel Featuring Gygan The Robot! Previous post We almost had a Mr. Belvedere TV Show in the 1950’s and 1960’s? Next post This Castlevania Print From Mondo Doesn’t Even Need The Konami Code!